The Blue Mountains National Park is one of the world’s most spectacular wilderness areas, containing thousands of square kilometres of rainforest, canyons, plateaus and sandstone escarpments. You’ll enjoy a whole range of sensory experiences from getting close to Australian wildlife, doing amazing bushwalks, exploring an enormous cave systems and creating some mountain nightlife – all within this world heritage region. An awesome start by meeting some Aussie animals at Australia’s award winning Featherdale Wildlife Park. Take a selfie with a koala, pat a kangaroo, stay away from the snakes. Then up the mountains for an amazing cliff edge bushwalk in the national park where the views and scenery are breathtaking. A big lunch to reenergise before seeing the famous Three Sisters and then another great walk down through the rainforest. Walk back up or take the option of the steepest railway in the world back to the top. Overnight accomadation is at the award-winning Blue Mountains YHA hostel located in the heart of Katoomba. Housed in a beautifully restored National Trust building, the hostel is a stone’s throw from breathtaking national parks and bush landscapes of Leura, Echo Point and Three Sisters. Check into our cool mountain accommodation where you have a free evening to chill or hang out in a local bar! Dorm share beds are included in the package with upgrades to private rooms available on request. After breakfast we’ll pick you up @ 10.00am to drive to Austraia’s biggest cave system, the Jenolan Caves. You’ll go underground for more than an hour exploring the caverns and beauty of one of the many caves. Lunch (own expense) is in the quaint village of Jenolan before it’s off to our secret location for close up photos of wild kangaroos and wallabies. 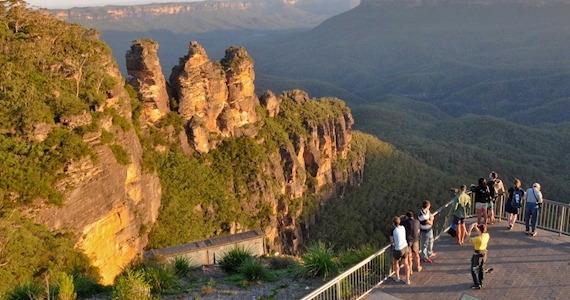 Our final stop is at one of the most spectacular views at Govetts Leap overlooking Grose Valley and untouched wilderness. What a full on Aussie weekend! Travel Voucher, Water bottle, Camera, Spending money, Comfortable walking shoes, Warm/wet weather clothing, Photo ID, 5kg small overnight bag/backpack, Towel & Toiletries.